2nd position and good pace for Laurens van Hoepen at the WSK Super Master Series last round placed in Sarno. A positive weekend for Laurens van Hoepen in Sarno at the WSK Super Master Series, where he finished in 2nd position. At the Circuito Internazionale di Napoli, the Dutch driver made himself the protagonist of a very solid performance. After scoring the best time in his qualifying group, in fact, he was the best at the peak of the heats as well as the winner of the Prefinal A. In the Final, after a 3-man fight, van Hoepen finished in 2nd position, proving to have a great pace throughout the weekend, consistently among the fastest in every battle. This performance also earned him 5th place in the championship. With these assumptions the young man prepares for the WSK Euro Series and, above all, for the FIA Karting European Championship, the latter among the most important objectives of his second and last season in OKJ. 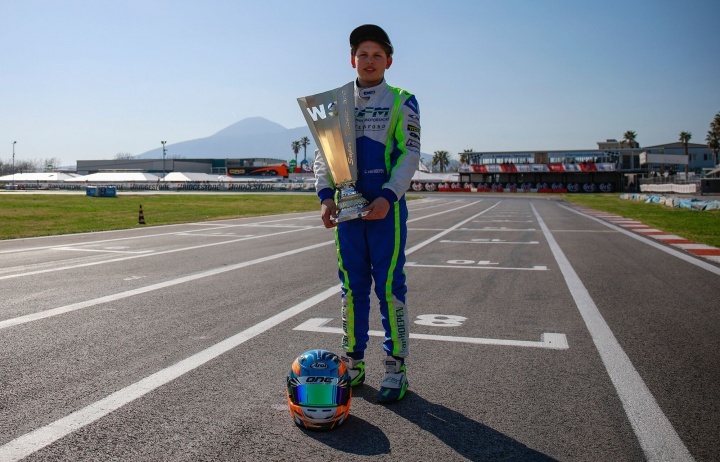 The 2019 season of Laurens van Hoepen continues this weekend always on the Circuito Internazionale di Napoli on the occasion of the first act of the WSK Euro Series.